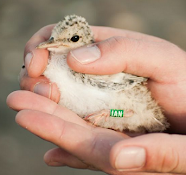 Kilcoole Little Tern Conservation Project: A Late Year? Since the last update, the full fencing system around the main colony site has been completed, well in advance of the birds settling. Day time counts of terns continued to fluctuate markedly, peaking at 60-70 birds during evening roost watches (all normal behaviour on the run up to breeding). We've also come past a run of Spring Tides which just about reached the seaward fence in places but thankfully caused no damage on account of the offshore wind direction. Furthermore, there's been very little activity from potential predators in the general vicinity. So all in all, no major complaints, everything going according to plan...except the terns have been late nesting! A pair was seen mating on 16th May which at the time, suggested to me that the first eggs were to appear around the 20th May (well within the average date range for first laying of 18th-21st May). But waited we did & the expected first clutch never appeared. And not for want of trying on the terns behalf! Courting & mating pairs were a regular sight along the foreshore in the mornings followed up by prospecting birds digging out potential nest scrapes in the afternoon. A new arrival of fresh faced individuals over the weekend of Sat 25th/Sun 26th May brought some much needed vigour to the colony. Display flights known as 'dreads' became more frequent with up to 100 birds in the air at times. The sudden increase in noise that came with it didn't escape the attention of the public who regularly commented on the fact that it was great to hear the colony 'as it should be' once again. And so it happened that on Monday 27th May, the first Little Tern nest of 2013 was found... K1, complete with 2 chocolate brown blotched, sandy eggs. A full week later than expected mind you, but hey, at least they've started!